We previously wrote about the basics of gambling fraud. Today, we’ll look ar a particularly prevalent form of abuse: when promos are used to cheat against gambling platforms. The online gambling market is expected to reach a volume of nearly $60 billion by 2020. No wonder it’s so cutthroat. Increasing user base and attracting new players is more important than ever for platforms who wish to remain competitive in the field. Promos are great way to onboard new users. In theory, at least, they encourage signups, don’t cost much to set up, and also function as loyalty rewards. However, they also open the door to fraudsters, who have no qualms about setting up multiple accounts to cheat the system in their favour. Collect signup bonuses: in order to cash out their promotional offers without actually playing. Collusive play: fraudsters can control multiple players in order to defraud unsuspecting legitimate users. Chip dumping: similar to above, when a poker player intentionally “loses” their chips to another player in order to affect the outcome of a hand. Arbitrage: increasing the winning odds on betting platforms. Often referred to as an “arb” performed by “arbers”. As you’ll see, there is no shortage of ways in which you can abuse a game if you control most of the players. Historically, promo abuse was a strong target because gambling operators offered large bonuses with low betting requirements. This truly opened the floodgates for fraudsters. Luckily, platforms were quick to take notice and rectify. Bonuses have been lowered. Requirements are higher, and restrictions have been put in place. Still, fraudsters have increased the sophistication of their bonus hunting. They are better are mathematically calculating their odds for arbitrage, and will be less obvious in their methods. This constant game of cat and mouse can create a real challenge for gambling operators, even those whose promos and bonuses are designed to be uncheatable. They tend to focus on quick fixes. Increasing the complexity of the bonus system is one of them. This usually means stricter rules for withdrawing the bonus, implementing a rollover requirement where they have to play the promo amount several times at least. Online gambling operators have to manage both promotions and user experience. If a bonus is too low or complex to acquire, it creates friction and slows down growth. Lowering bonus payouts is another legitimate solutions. But online gambling operators have to manage both promotions and user experience. If a bonus is too low or complex to acquire, it creates friction and slows down growth. This creates a tough balancing act for platforms targeting the growth of their user base, but who also want to increase their bottom line. IP – including proxy and VPN detection. Email: when was it created? Any associated social media accounts? Card data: is it prepaid? A virtual card? What does the BIN number tell us. Device fingerprinting: collecting all the accessible parameters of a device being used. Password hash: are the password shared, or even similar enough to look suspicious? Registration length: fraudsters might complete the registration process faster if they’ve done it before. Betting / behaviour to withdrawal / cash-out ratio: a complex metric that could flag potential abusers, there is a shorter time-span between registration and withdrawal or chip dumping when the account is fake. It’s very suspicious if a freshly assigned bonus get lost instantly at a poker table to a third person. Preferred games: certain games will tend to attract more fraudters than others, especially low odds games to minimize risk. And of course, ID verification and KYC processes are as important as ever. In fact, it’s now a legal requirement for a growing number of jurisdictions. But it’s also worth noting that IDs are easily bought online, or stolen through phishing. 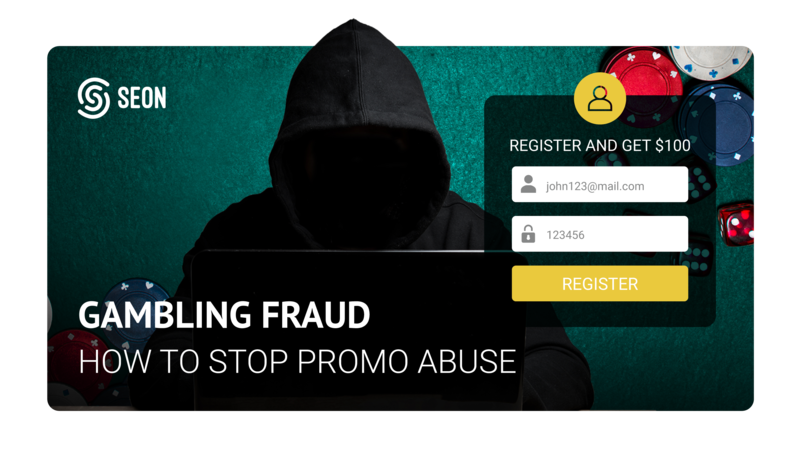 Like with all fraud, there is no single magic bullet that will stop scammers from trying to abuse your gambling platform. Ensuring you battle fraudsters on all fronts is the only way to keep users playing, attract new customers, and offer fair deals to those who deserve it. 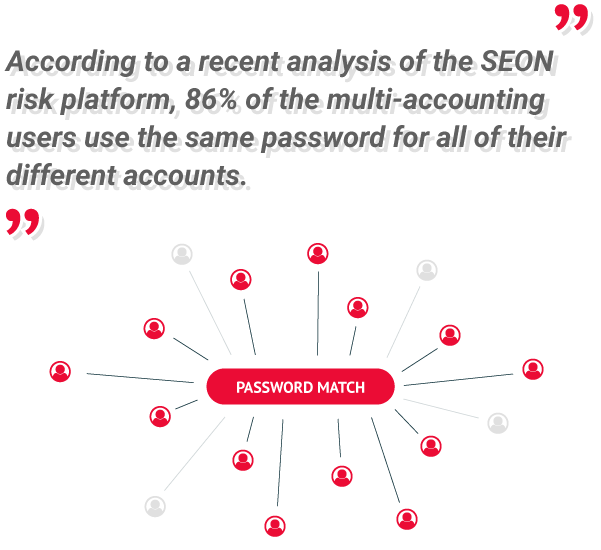 Luckily, by using a complete end-to-end fraud prevention tool like the one we created at SEON, you will be able to lower your overheads while still offering legitimate users a good reason to play – a win-win solution!